Pandora Radio is your own personalized radio now available as a Windows 7, Windows 8 or Windows 10 app. Just start with the name of one of your favourite artists, songs or classical composers and Pandora will create a "station" that plays their music and more music like it. 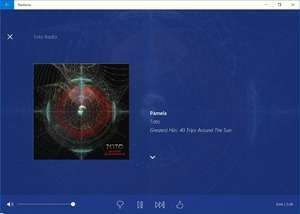 Pandora Radio is your own personalized radio now available as a Windows 7, Windows 8 or Windows 10 app. Version 13.0.39.0 is a freeware program which does not have restrictions and it's free so it doesn't cost anything. For security reasons, you should also check out the Pandora download at LO4D.com which includes virus and malware tests. Additional screenshots of this application download may be available, too. Pandora Radio download been highly rated by our users.